Each year we now produce an 'Annual Review' for Friends and Members, which incorporates a summary of our formal Year-end Report, plus what we hope are some interesting highlights of the year in question. Members and Friends are sent these annual reviews as soon as they are produced each summer, and have an opportunity to attend our AGM each October and raise any issues. 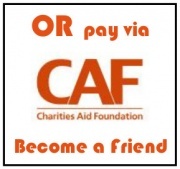 If you would like to become a Friend, you can read more on our Join Us page, and then complete the application form. One of the main conservation aims of the Magog Trust is the management of species-rich grasslands, so we are delighted to have the support and interest of organisations such as the Cambridge Natural History Society: their expert assessment of the flora and fungi is a very welcome “breath of fresh air” in amongst the day to day issues of mending fences, managing contractors, applying for grants and paying the bills. We hope you enjoy this report of their recent visit, and next time you are up at Magog Down yourself, perhaps as well as admiring the fabulous views, you might spot some of these interesting species for yourself. You can also read David Yarham's engaging articles about many of our wildflowers in the Flowers at the Down pages. It was admittedly the start of August, but clearly the weather thought otherwise and produced what seemed like early autumn rain and wind. An intrepid duo of cyclists from the CNHS braved the elements to scale the heights of Magog Down. With drizzle still falling we began with a tour round the car-parking areas, admiring the naturalised Silene coronaria (Rose Campion) and Physalis alkekengi (Japanese-lantern). There were also some rather withered grasses, including Catapodium rigidum (Fern-grass) and Vulpia myuros (Rat’s-tail Fescue), as well as a selection of Fleabanes. Once it was evident that no-one else was going to come, we set off up the Down. Many of the downland plants had also decided it was autumn, but we admired a big Cirsium eriophorum (Woolly Thistle), which is mostly found in the west of Cambridgeshire, but with disjunct populations on the Gogs, Cheveley and Shudy Camps. On the South Down we thought the sheep grazed paddocks were in fine condition. There was a group of Campanula glomeratum (Clustered Bell-flower) and a scattering of Cirsium acaule (Stemless Thistle) and Plantago media (Hoary Plantain). Particularly noteworthy was a small cluster of Waxcap fungi, possibly Hygrocybe coccinea, in the lower paddock. This group of fungi usually indicate high quality un-improved grassland, and it can take many years before they appear on converted land. In comparison, Colin’s Bank and paddock looked a little over-grown, and whilst we didn’t spot any Campanula rotundifolia (Harebell), there was Scabiosa columbaria (Small Scabious) and Helianthemum nummularium (Common Rock-rose). With the overcast sky, and dusk seemed to come early, so it was then a more rapid transit back to the cycle racks and downhill to Cambridge. 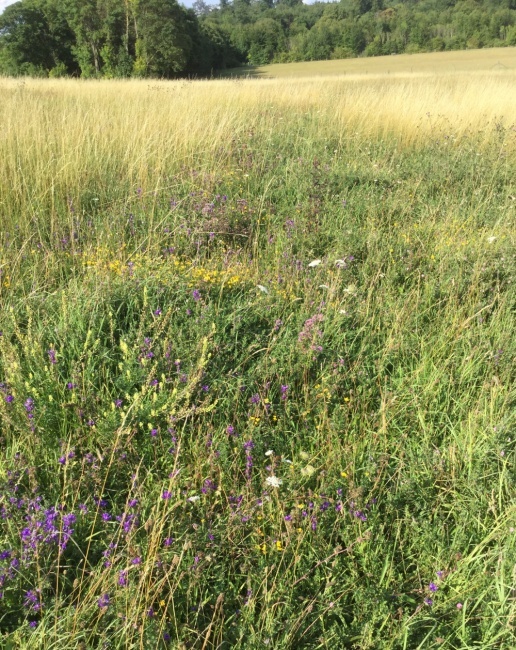 This photo taken in late July 2017 shows an array of flowers in Colin's Paddock: blue/purple clustered bellflower and spikes of pale yellow mignonette; the yellow flowers further back are birds foot trefoil and there is a small patch of pink marjoram in the centre. (Click on photo to see at larger size in a pop-up window.) Photo by Bryan Davies. In 2011 the re-designed website was launched, and so the decision was taken to stop producing these Newsletters, and instead to use this website as the main means of communication for news and articles of interest. This move away from a regular Newsletter meant that more of the Members' and Friends' subscriptions could be spent directly on the costs of upkeep and husbandry on the Down. 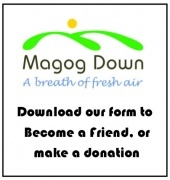 We would love every regular visitor to Magog Down to help support its upkeep by becoming a Friend. Read more on our Join Us page, and then complete the application form.